Can't stop, won't stop! 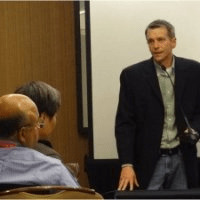 We've been pretty active at different expos and trade shows this year and have even written a few blogs about how they're a great opportunity to not only meet fellow electronic manufacturing, engineering and supplier attendees but also to learn about relevant trends and issues going on in the world of electronics. The West Penn SMTA Expo and Tech Forum was no different, and I was lucky enough to speak with some of the presenters beforehand to get a little background. In the spirit of Throwback Thursday, here's what I learned! First up, I chatted with Chris Laplante, Reliability Engineer at Qualmark Corporation. Your title is "Reliability Engineer." What does that job entail? The tasks of a reliability engineer vary from company to company. The goals, however, should remain the same: improve and maintain your products to not only meet but exceed the expectations of your customer. You don't just want to meet specifications when designing the product, but you want to continue to monitor the product to maintain its reliability and improve on it when necessary. How did you get your start at Qualmark? I previously worked as a reliability engineer for an aerospace defense company. I had reached a point in my life where I wanted to make some changes and one was moving to a new city. I found a job opening online with Qualmark in Denver and applied. I was really intrigued by the eclectic nature of the job and the potential to travel. The interviewing process went smoothly and I was working for them within a couple months. I believe there are a few great things about my job. For one, I get to travel the world and meet many interesting people. I not only get to work with a multitude of industries and products, but I also get to learn about those different technologies and get paid to break them. What's your biggest piece of advice when it comes to testing electronics? I think a very important thing to remember when testing electronics is to remember your goals. Depending on the test, you may be validating a spec or you may be looking for failure modes. It's easy to get caught up in "pass/fail," but remember by testing you have an opportunity to learn more about your product. That will become valuable information as the life of the product progresses and moves into future generations or similar products. Next up, I talked with Ravi Parthasarathy, Senior Process Engineer, ZESTRON America. What does a Senior Process Engineer do? As a Senior Process Engineer at ZESTRON, I am responsible for providing customers with tailored technical solutions to their cleaning challenges. How did you end up at ZESTRON? While completing my Master’s Degree at Texas A&M University, I searched for a career opportunity which allowed me to focus on chemical engineering. I started in 2004 immediately after graduation, and joined the Application Technology department and began my career here. What would you say is the most interesting part of your job? The most interesting part of my job is process optimizing, and working with new technology. I also enjoy providing customer support and helping them with their cleaning challenges. And last but not least, I had the opportunity to get to know Andy Cameron, Field Application Engineering Manager, TTM Technologies. What exactly is a Field Application Engineering Manager? Field Application Engineers (FAEs) work at customer sites to assist with the design and development of very complex circuit boards so they can be manufactured cost effectively and with high reliability. Managing our North American FAE group entails providing direction and focus on things like what technical bulletins, presentations and training materials we will create and provide to our customers to assist in the design process. What does TTM specialize in? TTM Technologies is a leading provider of time-critical and technologically complex rigid, rigid flex, flex and backplane products as well as custom assemblies which serve as the foundation of sophisticated electronic products. We are a top 10 global PCB manufacturer and have specialized and integrated facilities in the USA, China and Hong Kong. What inspired you to pursue a career in engineering and electronics manufacturing? Basically the early days of personal computers, cell phones “bricks” and pagers intrigued me. It’s one of a few careers that blend so many engineering disciplines: computer, mechanical, electrical, and chemical engineering. It never gets stagnant. What would you say is the most interesting/best/challenging part of your job? Sharing the knowledge that I’ve been fortunate enough to build up over the last couple decades is the best part of my current role. The most interesting AND challenging portions are trying to forecast what technologies are next and when they will reach critical mass in terms of demand. The “what is next” is relatively straight forward but the “when” can be more challenging and dynamic. 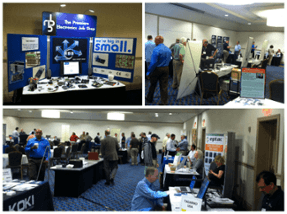 It was a great experience getting to know the West Penn SMTA Expo & Tech Forum speakers, especially when getting an insider's look at the world of electronics manufacturing and engineering. As for what's next for RBB? We'll be back on the road in 2015, exhibiting and taking advantage of the educational sessions offered at each forum- and in the meantime, we'll keep doing what we do best: manufacturing small batch electronic assemblies.